Giving with Kids in December? Here's How. Giving during the holiday season is a tradition for many. This is the time of year when food banks and donation drop-offs are working at capacity. Companies often sponsor parties or volunteer-driven events for nonprofits. Many of us are simply feeling a bit more joyful and generous and December means endless opportunities. But, giving with kids in tow? Or even having the kids do the giving? Hmm... Can it be overwhelming? Sure. Aren’t there limitations? There can be. Determine frequency. Maybe this year, you’ll start out with designating one day to give with your kids. Or maybe it will be once per week. Or maybe you’ll go for it and commit to giving every day. Whatever it may be, giving is giving! Choose giving that works for your family (consider finances, time, location, etc.). Do you have wiggle room in your budget to give financially? Do you have time to bake or shop for items? Are you located in an area with a wide variety of nonprofit organizations? Do you have babies or teenagers? And so on. Decide how you want to give. Do you want to give with time or random acts of kindness? Do you want to give with money/items or food? Volunteering time? Determine where are you going to give. Are there specific populations/groups/organizations you have in mind? Is there an organization that supports the interests of your children? Just do it. If you don’t know where to begin, simply pick one and go for it! Once you think about the factors above, a little research and prep work will help it go smoothly. You can search local, national, or global organizations. And if you find something that piques your interest, don’t hesitate to reach out and ask how you can help! Many organizations have an age requirement to volunteer. This is due to liability, age-appropriateness, ability to take on needed responsibilities. You may find this frustrating. Understandable! However, we always want to keep in mind that we’re giving in order to help and the last thing we want to do is create more work for the staff or issues for an organization. Unless it is an emergency or issue of health, do everything you can to follow through with your commitment to organizations. Many organizations rely on volunteers and if they don’t show up, it can mean food won’t get served or supplies won’t be collected. Prepare your children for any giving activities in advance. Explain what you’re doing before you go — what to expect, why you’re doing it, appropriate behavior, etc. If you’re volunteering and your child is having a rough moment (it happens! ), take them out of the room for a bit or go for a short walk. Remind them why you are there. And if they’re just not into it, see if there’s an alternative activity they can participate in to ensure everything goes as smoothly as possible. Being flexible is key! Fill a bowl with slips of paper and take turns pulling one out each day. Write acts of giving on a chalkboard or letter board. Wrap up a small box that you can reuse and stick a note inside. Or do you celebrate Christmas and have an advent calendar? This is a simple way to introduce giving into your child’s daily life in December. Tuck notes inside small envelopes of a handmade advent decoration. Write on the links of the classic paper chain. Put a note in each section of an advent box. Place small notes on the back of store-bought chocolate calendars. Whether Pinterest-worthy or simple, the experience is the same. There is no right or wrong. There is no one size fits all families. But giving in this way is possible and it is meaningful. And I promise that this tradition will become one of your family’s absolute favorites! Follow along on our family’s December givingPROJECT adventure 2018 on Instagram @givinggrows. For My Children on Giving During this Season. And Always. I hope that you learn through your lives that giving, in its purest form, feels good and is necessary and will change your life and worldview…that it does make a difference. I hope that you take in the privileges with which you are being raised, right alongside the injustices that you and those around you may face. I hope that you always think about how life circumstances make others feel, even if you have never been in their situations. I hope that you shed tears for those who hurt and radiate joy for those who accomplish. I hope that you offer a seat to the person on the subway who just looks so tired. I hope that you put down your phones when you are crossing the street to help a struggling mom and her kids or an elderly person cross safely. I hope that you pay for someone’s meal or purchase when you can, just because you are moved to do so. I hope that you are the corporate volunteers who push to have a party for underresourced kids and take time away from work to participate. Or that you volunteer on the weekends and take action to improve something you feel needs it. I hope that when you are able to, you will donate to the organizations who are working tirelessly to protect and to educate and to feed and to clothe and to provide. I hope that you stand up for what you believe in and choose to act peacefully and with love. I hope that you welcome neighbors and anyone who needs a place to go into your homes. I hope that you always have perspective about what you have and how there is always someone who needs something that you can spare. I hope that you always treat all people with kindness and respect and love and giving. We often hear from you that the process of searching for giving opportunities can be overwhelming and makes it tough to "just get started" giving with your kids. To simplify the process for you, we are beginning a monthly givingPROJECT! Every month, we will choose a different theme and offer some simple ideas for giving within that theme. If it works for your family, please join us! And if not, there's always next month. You can do one or all of the ideas or create your own -- there are no rules here. :) We hope this is as fun for you as it is for us. And please share with us how you're giving! However you choose to give with flowers this month, as always, be sure to include your children at every step and discuss how you are giving, to whom you are giving, and how you feel it will make a difference. Toward the end of last school year, I had the privilege of speaking at Redding Elementary School (RES) in Redding, Connecticut. Many schools across the country participate in the One Book, One School program, where every classroom reads the same book and each student then takes the book home to read. RES is one of those schools. The book they selected was Boxes for Katje by Candace Fleming. It is a beautiful story that illustrates just how giving grows and shows the strength of relationships we can form with complete strangers from anywhere in the world, through giving. When I was asked to speak, I had no idea just how inspired I would be from the entire experience. That school and those students embodied everything that is kindness and respect and giving. It impacted me just as much as I hope the day impacted them. After the teachers and administrators announced the selected book, I spoke to grades K-5 about my definition of giving and the waves of giving that can grow from one small act. The town meeting was completed with a school-wide cheer of "giving starts with me!" and everyone returned to their classrooms. And then I (the giving fairy, of sorts) walked around the school and handed every teacher a givingJAR for each classroom. The kids cheered and I was overwhelmed by their excitement and gratitude. 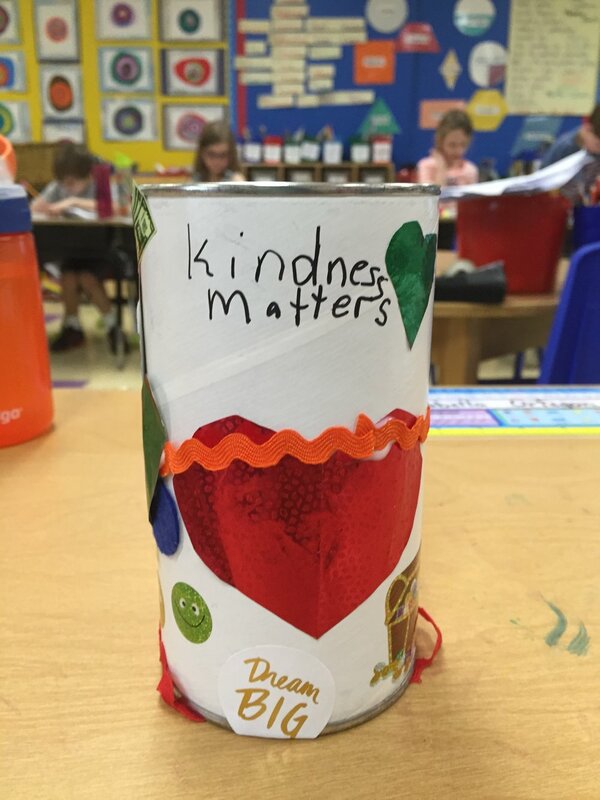 The classes learned a lesson in teamwork as they constructed a givingJAR that represented their classroom and came up with their first decision on how and where to give. 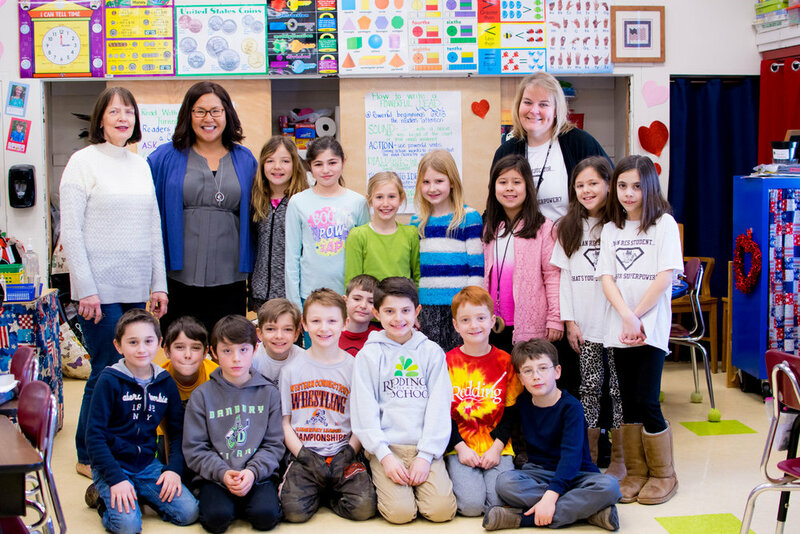 After the event, some of the classes shared with me their plans for giving; buying supplies for Greenwich Hospital, donating money to a local high school student who was paralyzed in a car accident for stem cell research, buying ingredients to bake cookies, donating money to Save the Children, to name a few. Incredible, right? I couldn't have asked for a warmer welcome or more inspiring day. Kids can do amazing giving! Extra special thanks to Brian Dayton for making this happen and to Liz Caruso for the beautiful photos! In 2015, we started an incredibly fun (and yes, at times, incredibly exhausting) tradition of a daily visit from the "Giving Elves" with our then 1 1/2 and 3 1/2 year olds. We found some adorable little whimsical "Elves" from Wildflowertoys on Etsy (who Milo quickly named Jingle & Bell) and got to planning. Each day, the Giving Elves leave a note for the kids and an act of giving for them to complete that day. Sometimes they also leave a little treat! This year is a little bit more challenging because Milo is now in school full time (with at least an hour commute each way), and with appointments, work and many other commitments, solid planning is even more important. Sometimes, tasks are broken up over a few days, because of time and let's face it...they're 2 & 4. But, we have many fun acts of giving; it is really so worth the hard work! Here is a compilation of the first 11 days -- you can also follow our daily posts on Instagram @givinggrows! Today's act of giving will go to a couple of children from Sheltering Arms. I showed them a short video on the website and and we had them each select a toy from their amazon wishlist. The note read, "There are some sweet kids at Sheltering Arms who are in need of some love and we think that those toys would give them a lot of joy." Luna chose the booster seat because "BABYYYYYYY!!!" And after much deliberation, Milo chose the game because well, he loves games too! I reached out to the sweet staff at the organization and once we receive the items, we will hand deliver them to the office early next week. (Gifts can also be sent directly to the office if anyone is interested in donating and not in NYC). Milo is having some serious questions about whether Jingle & Bell are "real" or not , but he's still loving it! Today's act of giving was outlined as the first step in a multi-step project scattered over the next week or two! And it was a parenting fail. The task was to purchase "lots and lots of socks." The note asked the kids to think about how they would feel if it was cold out and they didn't have socks to keep their feet warm. So, after school, we ventured out to several different stores in our neighborhood in an attempt to buy reasonably priced socks. And guess what...NO SOCKS!! Boo urban living! So, we came home and bought them on ebay in bulk. Although I prefer the kids seeing an exchange of money for goods/services, this will have to do. After all, it was a long, dark walk home and we still didn't have socks. It happens. More to come on this top secret sock project! This afternoon we had a friend's birthday party. He has a givingJAR and is collecting money to donate to an organization in his birth country of Costa Rica. This organization cares for babies and children not in the care of their families. His super creative mama asked us to bring along some coins for his givingJAR because she had an activity for them. Jingle & Bell asked Milo and Luna to each fill a bag with coins from our collective family jar (aka coin graveyard) and bring them to the party. The kids were given a brief description about the organization and a question was posed to them about how they would feel if they didn't have family who could care for them. Since the party had a Paw Patrol theme, my friend made an adorable little puppy station with a sign that read, "Adopt a puppy, help a child." 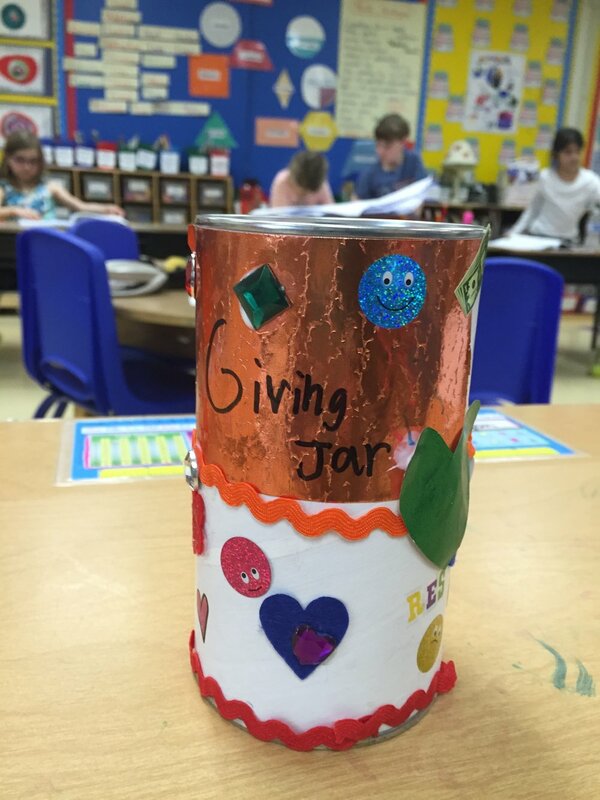 What a creative way to incorporate the givingJAR into a birthday party! It was a hit! We stayed in Connecticut with friends last night, but I brought our little buddies along with the kids' note for today because I knew we wouldn't get home until late. They were so excited and mystified that Jingle and Bell made it all the way to CT and to share their giving adventure with their friend. Today's act of giving was to buy an extra large case of water bottles to join the socks we bought the other day. We stopped at the store on our way home and the kids picked out the biggest case of water they could find. A simple act, but it will make a difference! Milo & Luna still don't know what this secret sock project is, but they will find out soon! Today's act of giving was to bake cookies of the kids' choice for the staff where Milo had an appointment today after school. They hold evening hours and Jingle & Bell felt they could use a late Monday pick-me-up! While Milo was at school, I baked cookies (Luna assisted) and we packaged them up with a little note that read, "Happy Monday! Hope you enjoy this sweet treat from Milo & Luna!" When we arrived, the kids delivered them to the office and were they ever grateful! Milo was thrilled that staff kept coming up and asking who made the "delicious cookies!" Our Secret Recipe Tip: No nuts, lower the amount of each sugar and add an additional 1 C of milk chocolate chips in with the semisweet. Huge crowd pleaser! And I always hand mix it just for some extra love. Today's act of giving from Jingle & Bell was for the kids to complete the final piece of the secret sock project. To go along with the socks and bottled water, the kids were asked to decorate and draw on cards. The note said that the cards were for people who "need some cheer" and asked for the kids to think about what might make other people smile or be happy. It was a busy day for Milo and he wasn't getting home until late, so J&B left little card packs with decorative supplies so that Milo could work on his cards on the subway. The kids love art (particularly Milo), so they had a lot of fun coloring and drawing and putting stickers EVERYWHERE. Since we need so many cards for this project, my husband and I have been tackling some, as well, and we will continue to decorate them until we have enough! Today was the day Jingle & Bell asked the kids to deliver the gifts that they ordered on Day 1 to Sheltering Arms! We hurried down to the office just below Herald Square after we got Milo from school 8 subway stops away. We had a full load--Luna in her stroller, IKEA bag with the booster seat and game & my backpack full of anything and everything we might need. Oh and 24 FLIGHTS of stairs. I'm not joking. In any case, we made it and it was totally worth it. A sweet employee named Michael came out to greet us and accept the gifts and the kids were so happy! Whenever possible, I always love cooking a meal for friends nearby when they have a new baby. There's so much comfort in receiving a meal and it brings me such joy to put love making it. For today, Jingle & Bell asked the kids to choose a dessert and to help me deliver the meal to our sweet friends who have just welcomed a new baby into their family! Milo chose brownies and Luna was certainly in agreement, so she helped me make them (new recipe--fell apart, but still tasted amazing) and I made a Korean noodle dish that always seems to be a crowd pleaser! These friends are super laid back and the kids got to play with their 3-year old while I got to hold the most beautiful, perfect little baby girl. Heaven! I am so, so happy for them. I hope my kids grow up knowing that acts of giving are equally important toward those we are close with, those we sort of know and those we don't know at all. Today is the day! We finally put together our secret sock project! Jingle & Bell explained the need for socks among people who are living with homelessness. They asked the kids to imagine how it would feel if they had to sleep outside in the cold and didn't have socks or other warm layers to wear. The sock project is for Volunteer New York! -- their DIY sock bundles project! Wrap a pair of socks around a bottle of water, stick a piece or two of candy inside and tie it up with a card. (Cards will be added another day) we quickly found that the secret is to stick a piece of candy IN each sock and then roll it up! The bundles will be given to an organization in the city that does midnight runs for the homeless. So simple and such a great project! When we sat down to start the assembly, Milo said, "It is so nice of Jingle & Bell to do this for people who don't have a lot of stuff or homes." And Luna shouted, "Or money!" And Milo said that it makes him feel sad. Sigh. Me too, buddy. This was a wonderful family act of giving to do together. Milo did great and helped with almost all of the 36 bundles (I had much lower expectations and expected this to go on for days) and Luna helped cut and hand us things and eat candy They were also a wee bit distracted because we have Milo's class bunny for the weekend. Jingle & Bell said that we would be delivering on another day soon! Today was a busy day! My husband and I headed off to Brooklyn bright and early to set up our booth at the Brooklyn Friends School Winter Fest! (So organized and everyone was so nice!) There were givingJARS galore! As a result, my parents graciously came into town to stay with the kids for the day. And of course, Jingle & Bell couldn't miss it! So, since my dad is pretty artistic and the kids love a good project, today's act of giving was to create signs for tomorrow! J&B informed the kids that we will be having a FREE hot chocolate & cookie stand tomorrow and of course creative signs are crucial to a successful stand! The signs turned out perfectly, the fair was great and I think we're all exhausted. We better rest up for a brisk afternoon tomorrow! This was such a fun giving day! Today's act of giving was to make hot chocolate and cookies and give it away at a stand near our local subway stop. While Milo and Josh were at a birthday party, Luna and I made cookies. Just before we left, I made hot chocolate (real hot chocolate!) and we kept it warm in some carafes that we had with extra in our crock pot. In less than an hour, almost a gallon and a half of hot chocolate and about 4 dozen oatmeal chocolate chip cookies were given out! Reactions included shock, confusion, disbelief that we wouldn't take money, joy, gratefulness, excitement, and more. One young girl squealed in delight after she took a sip and said, "If there was a word for more than delicious, I would use it!" So cute. Our visitors included families taking walks, tourists visiting our nearby park, couples exploring, MTA employees on break, people walking their dogs, friends meeting other friends--we met so many people! As we were walking home, Milo said that next time he want to remember to say, "I hope these make you feel better from the cold." The kids LOVED this activity so much. It looks like Jingle & Bell will have to request this again before the month is over. And throughout the year! ***And sidenote, you may see that one of the Giving Elves is absent in the photo above (the kids seem to disagree about which one is Jingle and which one is Bell). That Elf isn't feeling well, so it is "sleeping." (Read: missing) Hopefully, it won't be sleeping through the rest of the month...ha! the spirit of giving in people of all ages by creating simple acts. The act of giving changes you AND the world.